The new hops have me rethinking the term "hoppy"
The article that Josh wrote about Mosaic hops and this post from Beervana about the new breed of fruity hops has got me thinking a lot about the term “hoppy” and what it means. In the Beervana link, Jeff makes the observation that even though Deschutes puts 60 IBUs on the bottle of their Fresh Squeezed IPA, the beer does not come off as bitter at all, it’s rather sweet. I’ve been thinking about the term “hoppy.” When you say a beer is hoppy, everyone knows immediately what you mean. We can expect some fantastic hop aroma and flavor, ranging from spicy to grassy to grapefruity to evergreen-like to quite recently (and extremely unfortunately) cat-pissy. The other day I tried Base Camp Brewing‘s MeridiWit. They made sure to tell people that the beer contained no fruit at all, just a bunch of Meridian hops. The beer was incredibly thick with what tasted like tropical fruit, orange juice, pineapple, mango, and lemon. I mean it tasted like a beermosa, super heavy on the OJ side of things. In the mornings I’ve been drinking the Simply Orange OJ with mango drink and this beer tasted like that. Any reasonable person would have assumed the brewer added large quantities of real, actual, fruit to this beer, but there was none. Do you remember Odell’s Imperial Peach IPA? That beer really surprised me because it was incredibly peachy tasting, very sweet, and not bitter at all. That beer tasted a lot like fruit juice too, and granted it did have plenty of peach in it so it’s certainly a different beast than the MeridiWit. But now I’m beginning to wonder if what I thought was actual peach was more like peachy hops hitting my tongue. Odell does mention in their PR that they wanted to showcase how fruit can enhance the qualities of hops. 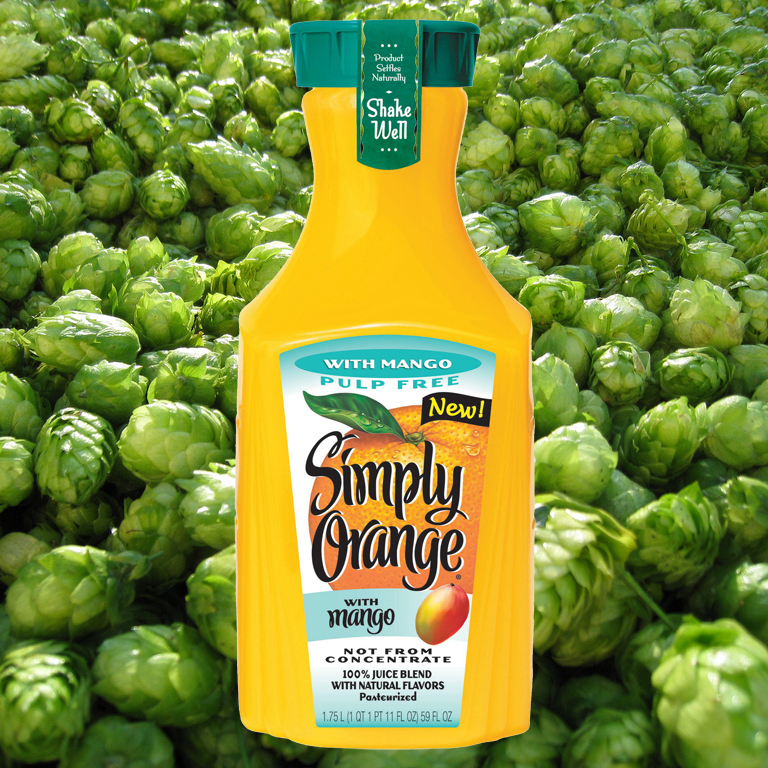 When I think of “hoppy beer,” there’s a good chance that fruit is part of the hop characteristic of that beer. I’ll get hints of lemon, grapefruit, and orange but these flavors are very much “hoppy” characteristics. I can tell that hops are producing these flavors and that’s why I call the beer hoppy. In this MeridiWit, and in a couple other beers that I’ve had recently the hops are tricking me into believing the flavor is coming from something else. These are two entirely different things. Do we call these beers “hoppy” at that point? Anyone who hates hoppy beers could very easily fall in love with these Super Fruit Hop Bombs. Is “hoppy” a confusing term for these hops, or appropriate? Perhaps there’s another terms we can agree to? Any ideas or thoughts? Has anyone had any beers that are brimming with fruity hops, have you been fooled as I have? I’d love to hear about it. To be clear, I’m not saying that bitterness and hopiness are the same thing in a beer. The difference is clear and well documented, and yes, IBUs have not been considered a sure-fire way to understand the bitterness in a beer. I’m stating that these beers are making me rethink what “hoppy” even means in the first place, unrelated to bitterness and more related to aroma and flavor. Brewers are having a lot of fun finding new and exciting applications for hops that are not about bitterness and pine. I have begun to wonder if the term “hoppy” carries so much baggage that some new term should considered for these beers. Or is it respectful to have hoppy encompass all that we now know hops are capable of? Does the new breed of hop change the character of what we perceive as bitterness? Can we even call it bitterness? The way a brewer would normally calculate the IBUs of a beer give us somewhat of an indication as to the bitterness of a beer, but if the hops that are used are actually fruity rather than bitter can we even use the International Bitterness Unit scale to determine this?